Join us on the beach for a session of sea fishing and expert tuition, followed by preparing, cooking and eating your catch at the River Cottage Cookery School. Designed by River Cottage in conjunction with our expert fishing guide, our Shoreline Fishing course is a dream day for all novice anglers. In a tranquil beach setting, we will teach you the tips and techniques you need to become a successful fisherman or fisherwoman, with a detailed lesson in rigs, baits, rods, reels and more. 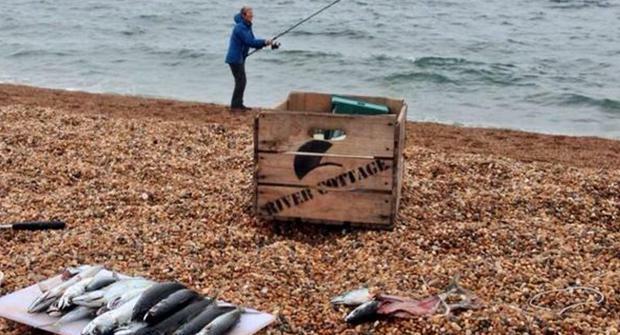 Then you’ll put it all into practice and, hopefully, reel in your lunch to cook on the beach. Laden with fish (fingers crossed! ), you’ll head to River Cottage HQ and learn how to fillet and cook your catch in TV’s most famous farmhouse. The only thing better than eating fresh fish is eating fish you have caught, prepared and cooked yourself, so you’ll finish the day with a hearty three-course supper. 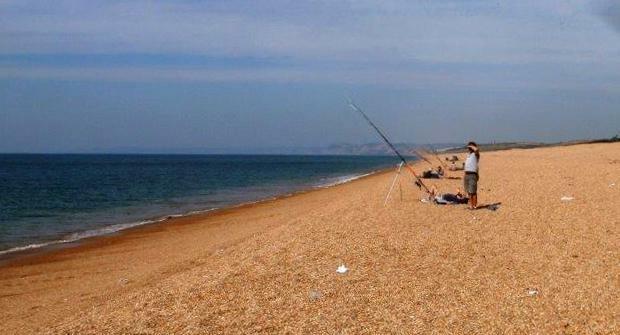 We will meet you at a local beach, one that offers the best chance of catching plenty of fish on the day. We aim to use a beach no further than 30 minutes’ drive from River Cottage. You’ll meet your host and tutor over a morning tea or coffee and a River Cottage picnic. Before you start fishing, we will walk you through some basic skills, such as setting up your rods and reels and baiting up your first cast. Then, time for the exciting part – attempting to catch your lunch. We will be on hand to help with any questions, and you’ll cover a range of different topics including: reading the water, species identification, seasonal variation, making up a rig to take home, preparing and baiting rigs, improving your casting technique and, most importantly, landing your catch. Once you’ve arrived at River Cottage HQ, a chef will be on hand in the farmhouse to show you how to prep the fish you have caught. Having prepared your catch, it will be time to sit down and enjoy the fruits of your labour. Our River Cottage chefs will complete your meal with a seasonal pudding. There will be time to chat to your fellow scholars and the River Cottage team, before being whisked back up the hill by our tractor and trailer at 5pm. We will run this course in all but the very worst weather, so we strongly recommend bringing clothing to protect you in inclement conditions. Sadly we can’t guarantee that fish will be caught on the day. But don’t worry; we will have plenty of fish standing by for the skills and cookery sessions if needed. Please note: This is a guide to the activities that will make up your course at River Cottage. This is by no means set in stone and will depend on seasonal availability. On occasion cookery schools will use equipment that includes induction hobs. It is recommended that people with pace makers should not work on these units. If you are concerned or would like to check whether or not induction hobs will be used on the course you are interested in, please call us on 01297 630302. Can’t find the right date? Click here​ to receive an alert when new dates are released for this event. 2. How many people attending? Please select an event date and enter the number of attendees above. This course is run from River Cottage HQ on the Dorset/Devon borders. Full address details of HQ will be provided once you have booked. We are a licensed venue. We have a wide selection of the finest organic wines available to purchase. If you need local accommodation we have a full list available. We would advise that this course is only really suitable for 12 years of age and upwards. Under 16s must be accompanied by an adult. We put these guidelines in place for the safety, comfort and enjoyment of all our guests. We would like to send you details about other River Cottage activities, events, information and products that we think you would be interested in. Please fill in your details to sign up to our mailing list.